Only a few weeks after announcing the ALEXA Mini, ARRI has announced the new ALEXA SXT cameras, a brand of 4K cameras that also brings an upgrade to existing ARRI cameras. 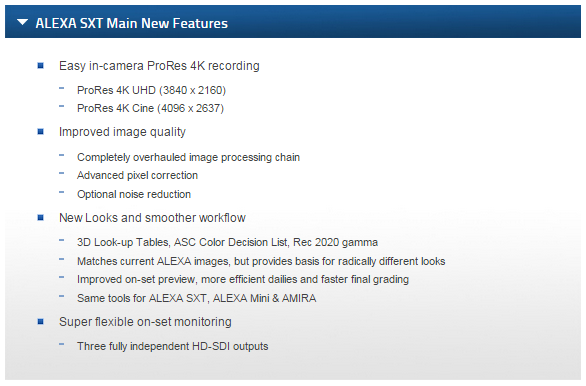 The new ALEXA SXT records 4:3 and 16:9 in ProRes 4K UHD and ProRes 4K Cine, as well as ARRIRAW and ProRes with the 3.4K ALEV III sensor common to other ALEXA models. This sensor is also known for its “extremely wide native color gamut”, allowing for greater control of the image. Coupled with the ALEXA SXT’s new ARRI Look File 2 (a.k.a. ALF-2, compatible between ALEXA SXT, ALEXA Mini and AMIRA), the camera is perfectly equipped to match other ALEXA models’ looks, as well as providing more efficient dailies and final color grading processes. The release of the ALEXA SXT signals ARRI’s inent to “[replace] current ALEXA XT cameras (though the ALEXA Classic EV model will remain in the line-up)”. This will culminate in the release of the ALEXA SXT, the ALEXA SXT EV, SXT Plus and SXT Studio models. Now, many may cry out that the release of this camera undermines the cameras released not long prior. However, ARRI is taking a very future friendly stance with this new model, as well as previous models. For starters, ALEXA XT models shipped between January 1st 2015 and the first shipment of SXT cameras “will be eligible for a full SXT upgrade, free of charge”. In continuing with their future proof mission, ARRI will also offer an “SXR (Super Xtended Recording) Module upgrade to owners of existing ALEXA XT, XT Plus and XT Studio cameras”. This module will grant all the features of the new SXT models, but without “all the future upgrade potential”. ALEXA SXT cameras keep the acclaimed 3.4K ALEV III sensor of previous ALEXAs and add the state-of-the-art electronics of ARRI’s groundbreaking ALEXA 65 camera. These high-performance electronics combine the latest generation of FPGA processors with a lightning-fast internal backplane and form the basis of a completely overhauled image processing chain, advanced pixel correction and optional noise reduction. This results in a further improvement in overall image quality. Like their XT predecessors, ALEXA SXT cameras retain the unique and popular Open Gate, 4:3 and 16:9 sensor modes, which can be recorded in ARRIRAW or ProRes. To further streamline on-set workflows and deliver what has been asked for by crews all over the globe, ALEXA SXT cameras include three fully independent HD-SDI outputs. This allows, for instance, a Log C image to be used to show the director a pristine image with live grading, a clean Rec 709 image to be fed to video village, and a Rec 709 image with status information overlays to be displayed on the camera’s on-board monitor. ALEXA SXT cameras are designed to keep up with the growing needs of changing production methods: their powerful electronics offer significant potential for future hardware and software upgrades, illustrating ARRI’s continuing commitment to the future-proof technology concept behind the ALEXA system.